We've been watching phones evolve at a breakneck pace with smartphones all but taking over, while cameras were stuck in the 20th century. Well, no more - the Samsung Galaxy Camera aims to stir the point-and-shoot market the way the iPhone did the phone market. Unsurprisingly, Android is just the OS chosen for the task. You see, the Galaxy Camera is a Galaxy S III that was grafted onto a point-and-shoot camera, which gives it abilities unmatched by any device in either individual category. No smartphone has the 21x optically stabilized zoom lens and the powerful xenon flash of the Galaxy Camera and no camera has access to the Google Play Store with all its hundreds of thousands of apps. You know what they say, the whole is greater than the sum of its parts. You can think of the various apps as building blocks, which make the Samsung Galaxy Camera one of the most versatile digicams in existence. If you need a certain functionality, just grab an app - or several of them - and you've turned the Camera into just the tool for the job, any job. Before we go on, let's talk pros and cons. Yes, even something like a Galaxy S III with optical zoom has cons. Apps are what powered the explosive growth of smartphones and there's a good chance that they'll do the same to "connected" cameras like the Samsung Galaxy Camera (note that Samsung has a line of Wi-Fi connected Smart Cameras that do not run Android). Of course, early smartphones had their fair share of issues and feature phones often outperformed them in the key area of being a phone. Will this be the case with the Galaxy Camera and regular point and shoots? Well, it's quite possible, but you'll have to read on to find out. We have to say that the 21x zoom lens is very impressive (even for a camera) and thanks to the Optical Image Stabilization, you can get a steady shot of distant objects and smooth videos. The 720p@60fps high framerate videos are quite exciting too and just in time for the boom of this technology - The Hobbit was shot at 48fps and 60fps is rumored for the next Avatar. 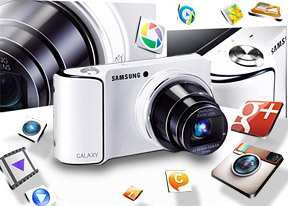 We usually do phone and tablet reviews and the Samsung Galaxy Camera is, well, a camera. Still, its review will read very much like the Samsung Galaxy S III review, mostly because the two are almost identical in terms of software. Except the Galaxy Camera has a really cool custom camera interface - the manual controls will give you the DSLR experience (if not image quality). The hardware would be indistinguishable from that of a regular camera, if it wasn't for the 4.8" big 720p display (that's unmatched in the camera world). Now that we've whet your appetite, you can jump over to the next page to see what else is unique about the Galaxy Camera.